The Elite® SC-LX501 featuring 7.2-ch Class D3 amplifier is fully-equipped for the latest multi-dimensional surround sound formats, Dolby Atmos® and is DTS:X™* Ready , featuring the Reflex Optimizer for enabled speakers. With Ultra HD (4K/60p/4:4:4) upscaling/pass-through and HDR/BT.2020 standards ready, images are ever more impressive. In addition to internet radio and various network streaming services, with Google Cast™** built-in you can use your mobile device to cast your favorite music to your receiver. The multi-zone feature supports powered ZONE 2 output. With the Class D3 (Direct Energy High fidelity class D) Amplifier, the SC-LX501 is ready to meet the needs of the latest HD content. With our MOSFET, the Direct Power FET, this simple, high powered solution is provided to fully meet today’s AV entertainment standards. The custom bypass capacitors further enhance the advantages of the Class D3 amplifier, producing powerful bass while also delivering subtle details. The SC-LX501 is Google Cast Ready, the same technology behind Chromecast built-in, so you can use your mobile device to cast your favorite music, radio, or podcasts to your speaker. You can control the audio from anywhere in the house using Cast-enabled apps running on your personal devices, such as iPhone, iPad, Android phone and tablet, Mac and Windows laptop, and Chromebook. This feature lets you take advantage of the highest-quality video source for viewing on a 4K TV. With support for HDCP 2.2, you can enjoy premium content such as 4K videos with digital copy protection on a compatible display. What’s more, the SC-LX501 is ready for HDR (High Dynamic Range) and BT.2020 next generation video standards. Create the ideal acoustic environment with Pioneer’s MCACC (Multi-Channel Acoustic Calibration System), developed through years of working closely with an award-winning recording studio. With the custom microphone, the system automatically compensates for differences in speaker size, level and distance, and equalizes response. 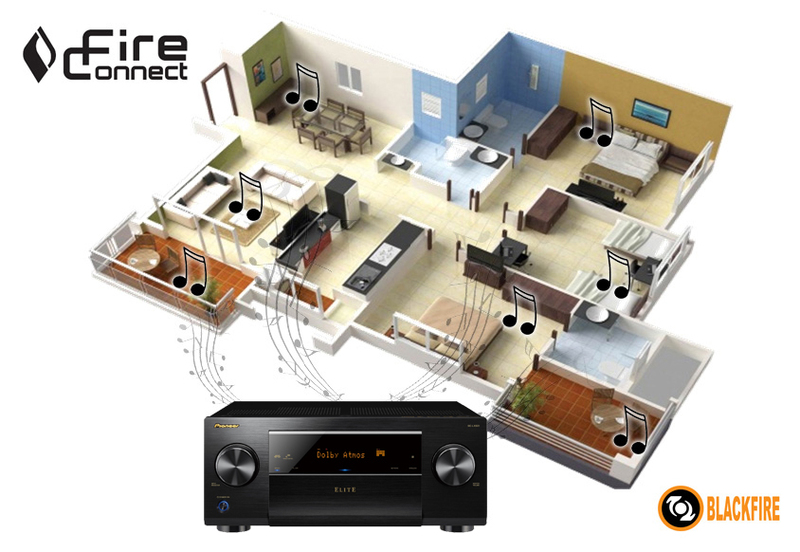 The SC-LX501 supports FireConnect™ Powered by Blackfire*. FireConnect is a stable wireless protocol that mirrors any audio source connected to the receiver—from vinyl to streaming audio—on optional FireConnect compatible speakers** in other rooms. An absolute steal for the money! I was looking to replace an aging Yamaha receiver. I needed one that was HDCP 2.2 compatible since I recently purchased a new 4K tv. The staff at Accessories4less made this an easy choice. I considered receivers from Onkyo and Denon in the same price range but I am happy with my decision. The sound is fantastic. The MCACC room correction makes me feel like I got new speakers. Especially the subwoofer. Buy it and you will not be disappointed. Yesterday I replaced a Yamaha RX-V575 that recently died with this receiver. I spoke with the guys here who made the recommendation, but I was a bit skeptical that it would be the improvement that they promised. I did my own research and ultimately pushed my budget a little higher than I was planning, and it was well worth it. I put on Roger Waters the Wall Blu-Ray once I got it hooked up, and you could literally feel the power. The sound is better than I've experienced on my system and better than I thought possible. I spent last night listening to different albums streaming TIDAL lossless, and couldn't get over how beautiful it sounded. Then late night I watched Inception and was blown away. Thanks to the guys at accessories4less for the recommendation and great service. I pushes my powersound audio 210s to ear bleeding goodness.